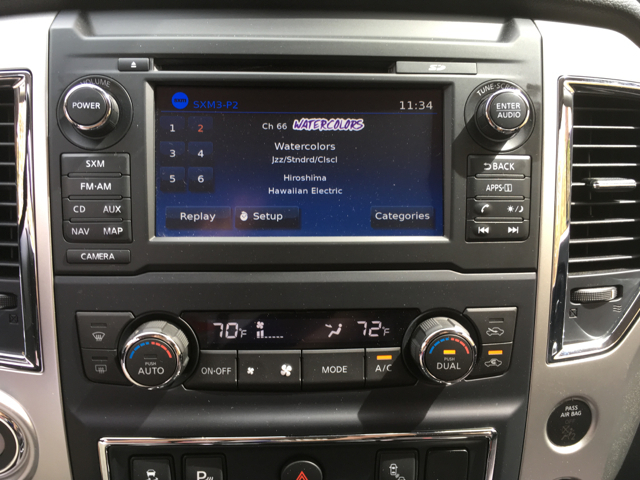 Nissan’s all-new Titan strikes a responsive chord. 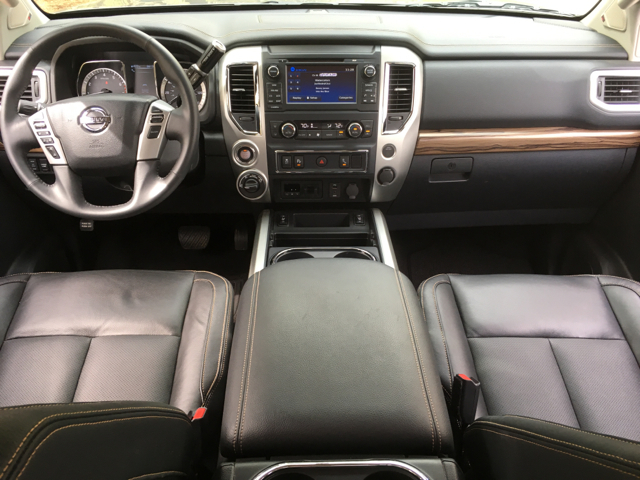 2017 Nissan Titan SL Crew Cab 4×4. Of the six major automakers with a presence in the US, Nissan is easily outpacing the other five. General Motors, Ford, Fiat Chrysler, Toyota and Honda looked on in envy last year as Nissan posted double-digit sales gains. Even as the market begins to pull back slightly, Nissan continues to outpace the pack. The Nissan Rogue is the biggest contributor to the brand’s success, so much so that March’s sales tally was close to 40,000 units. Through the first quarter this year, Nissan has sold more than 111,000 Rogues, outpacing the Toyota Camry — America’s perennial best-selling car. Not all models sell anywhere near as close to the Rogue, but not a few are contributing records sales. 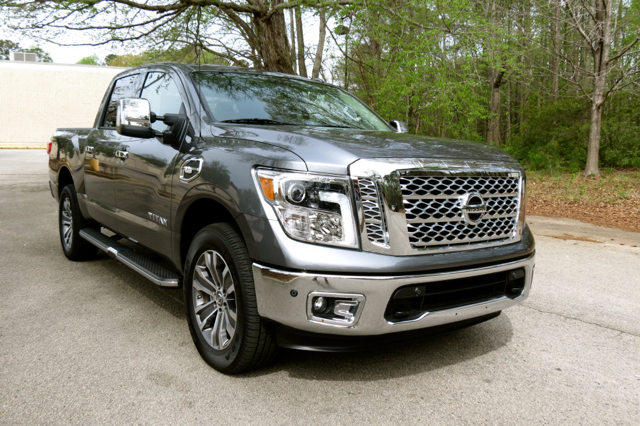 The Nissan Titan, a full-size pickup truck, topped 5,500 units sold last month, a record. Although this number is roughly equal to the number of F-150 trucks Ford sales every three days, it is still noteworthy. After all, until the 2017 Titan redesign — following the introduction of the Titan XD in 2016 — achieving monthly sales of 1,000 units was no small feat. 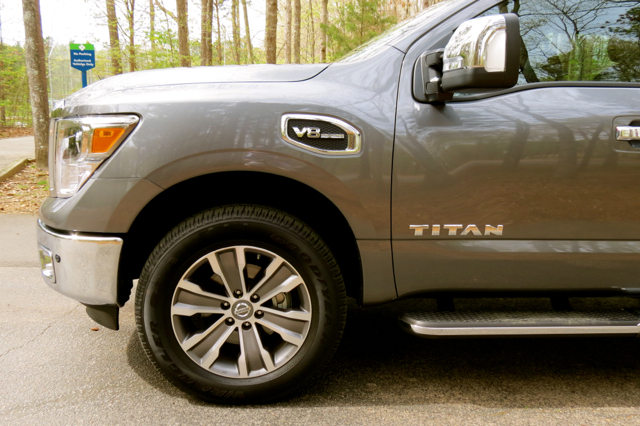 Today, large pickup truck shoppers see the Titan/Titan XD and like what the duo offers. 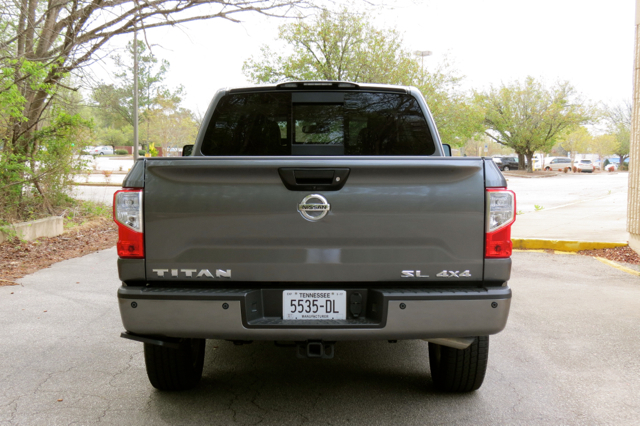 I’ve spent ample time driving and reviewing both the Titan XD and the Titan. If you follow these pages, you already are familiar with my explanation outlining the differences between the two — the Titan is the standard pickup truck, while the Titan XD fills the white space between light- and heavy-duty full-size pickup trucks. That also means Nissan isn’t participating in the heavy-duty class, continuing to allow Ford, Chevrolet/GMC, and Ram to control the market. At the same time, the Titan XD provides upwards of 12,000 pounds of towing capacity without the steep price of the heavy duties. 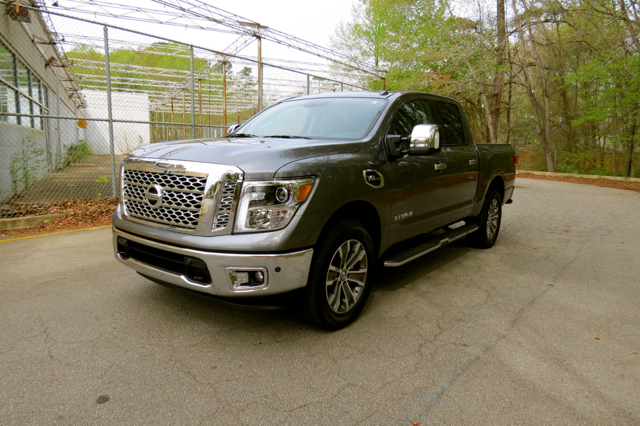 Following the Titan XD’s introduction in 2016, the redesigned Nissan Titan launched in 2017. The first-generation model lasted an uncommonly long 12 years — from 2004 to 2015 — there was no 2016 model. The 2017 Nissan Titan comes with standard rear-wheel drive and available four-wheel drive. Single and crew cab options are available; there is no extended cab. At least not as of this writing. The Titan single cab is available in two trims: S ($29,580) and SV ($32,460) plus a $1,195 destination charge. Add $3,030 for four-wheel drive. The Titan crew cab is available in five trims: S ($34,780), SV ($37,670), PRO-4X ($45,020), SL ($46,380) and Platinum Reserve ($52,310). The same destination charge applies here, but the four-wheel drive premium ranges from $3,030 to $3,090, depending on the trim. The PRO-4X does, by the way, come in four-wheel drive only. My test model was the four-wheel-drive crew cab dressed in SL trim. Nissan was tame with the packages, including offering only the towing convenience package ($360), pushing the final price to $51,015. 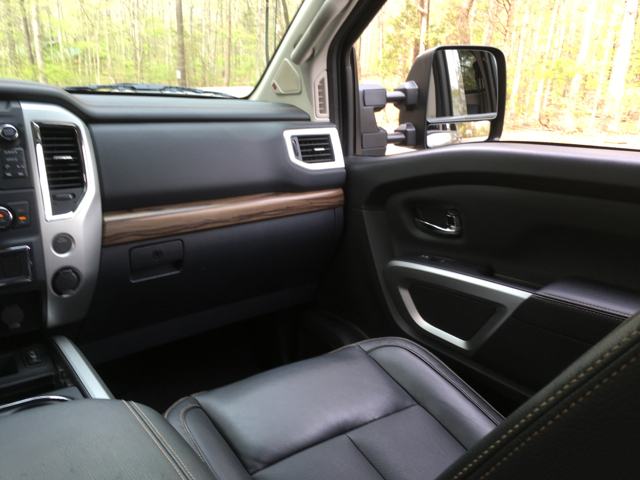 At this trim, there are three other packages available: chrome ($1,200), Texas ($1,250), and off-road ($400). I should point out the chrome and Texas packages are an either or proposition — both make important changes to the exterior, with one geared toward fanciness along the lines of GMC’s Denali trim and the other advancing a southwestern look commonly available in this segment. The off-road package is, by the way, rolled into the chrome and Texas packages. All told, you could pay as much as $52,265 to drive away in a 2017 Nissan Titan Crew Cab SL 4×4. My test model came with a broad front fascia amplified by LED lights, a massive hood, side vents with “Endurance” badging, and alloy wheels. 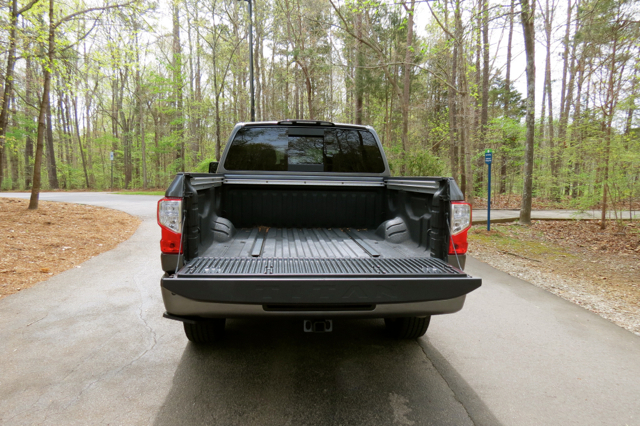 At the rear is a locking tailgate with a retractable step bumper. A bed management system with rails and hooks is also present. If there is anything of concern I would have about the exterior is the strength of the retractable step. It held my near-200 pound weight just fine, but some of you guys are beefier, topping 300 pounds…easily! I couldn’t find any information about a weight limit. Personally, I like GM’s corner step bumpers the best in this segment. 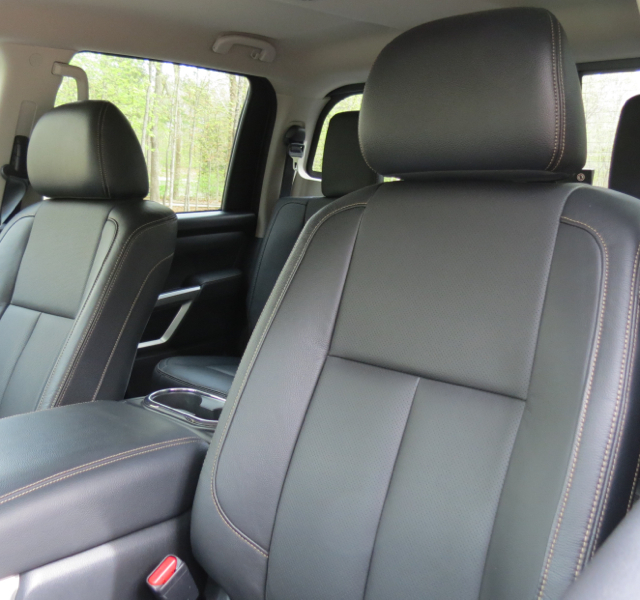 The Titan Crew Cab seats five with generously portioned and comfortable bucket seats up front and a 60/40 split fold-up seat in the second row. That second-row seat also conceals an in-floor storage compartment, ideal for hiding tools and other pricey items out of the sight of prying eyes. 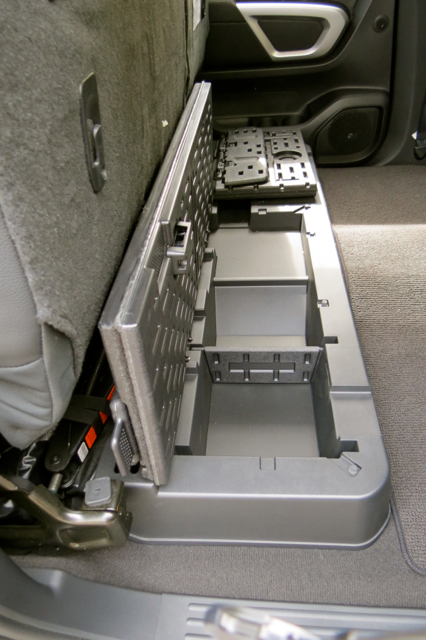 Sure, you could still use an in-bed toolbox, but if you’re concerned about theft, the in-floor storage compartment is a nifty feature. 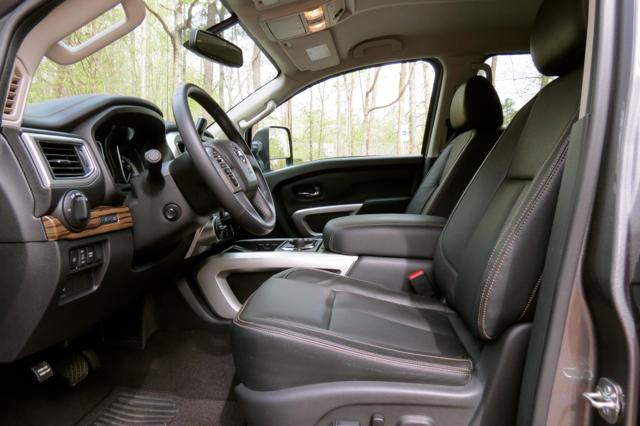 Full-size pickup trucks offer the most interior room of any two-row vehicle on the market. Nearly everything seems larger too — from the massive instrument cluster to a sizable center stack. I especially liked the oversized covered storage area between the seats — it is a great place to stash a laptop or a purse. You’ll also find in-door storage areas with two drink holders and a storage pocket. Four cup holders and seatback pockets are also present. 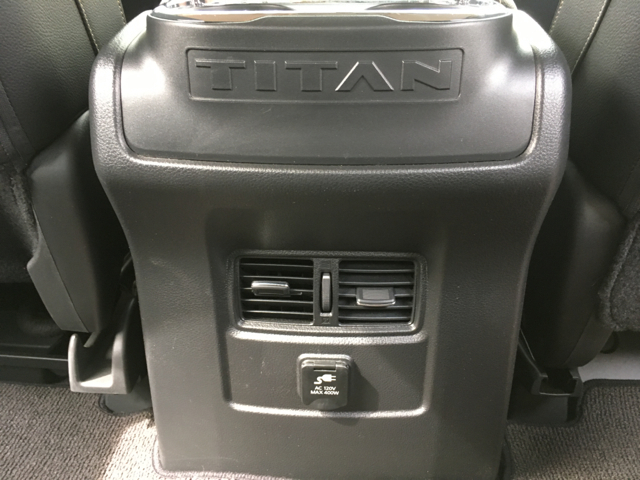 The Titan SL comes well equipped, adding leather seats, heated front seats, a 12-speaker Rockford Fosgate audio system, a power-sliding back window with defroster, and a power tilt and telescoping steering column to the list of features. This model already comes with full power accessories and six airbags. You’ll also find trailer sway control, blind spot warning, rear cross traffic alert, and a front and rear sonar system for ease of parking. For now, the lone powertrain choice is a 5.6-liter, V8 gasoline engine, also available in the Titan XD. 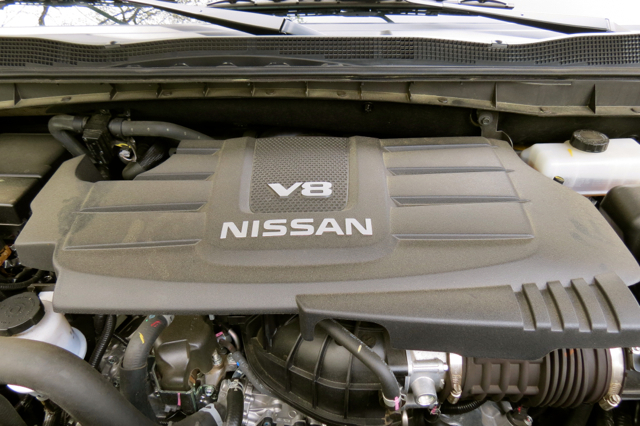 The V8 makes 390 horsepower and 394 pound-feet of torque and comes paired with a seven-speed automatic transmission. A V6 engine arrives later, but it will be available with the single cab only. The EPA rates this model at 15 mpg in the city and 21 mpg on the highway. No, the Cummins 5.0-liter turbo-diesel available in the Titan XD is not available in the standard Titan. I asked a Nissan spokesman about this discrepancy and his answer was decidedly noncommittal. That means either the diesel will stay with the larger model or arrive later. Personally, I think Nissan would do well to make the Cummins as widely available as possible. As for the V8, it is entirely suited for the task. No, I didn’t have anything to tow, but with 9,730 pounds of towing capacity and a 1,930-pound payload limit, for the single cab, you have a hard worker at the ready. Choose the crew cab and those numbers fall to 9,390 and 1,610 pounds, respectively. But still highly competitive. Some pickup truck engines seem to strain under the load or offer long shift points between gears. Not so with the Nissan. The Titan isn’t quick off the mark, but as speed builds, it moves with authority. Passing power is excellent and I imagine if you were to tow, you’d be happy with the Titan just as you would with a Ford F-150, Ram 1500, Chevrolet Silverado, GMC Sierra or Toyota Tundra. 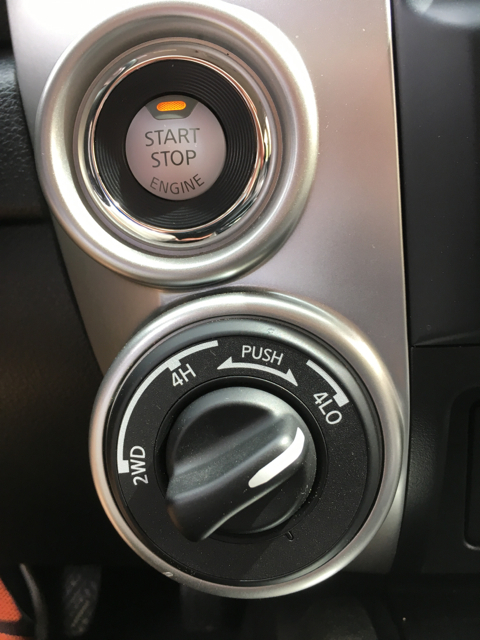 If you choose the four-wheel-drive model, you’ll find a switch-operated two-speed transfer case for shift-on-the-fly action — at speeds up to 60 mph. I’ve taken both the Titan and Titan XD off road several times and can vouch that each one is up to the task. 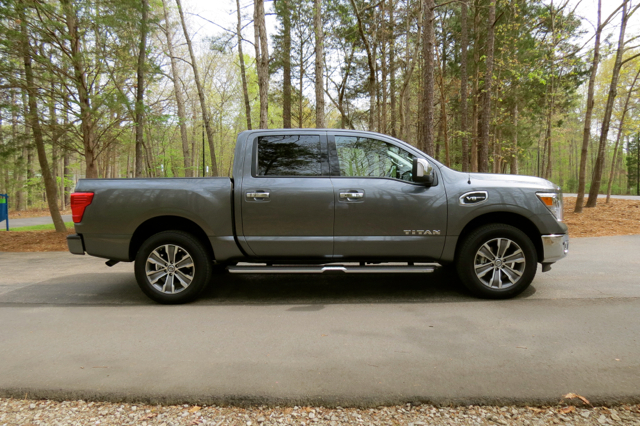 The 2017 Nissan Titan in Crew Cab form should meet the needs of most buyers. It is a highly capable truck with a ladder frame and the on- and off-road credentials to go with it. As with any large truck, prices can jump very quickly. For a well-equipped four-wheel drive model, expect to shop in the $45,000 range. At the same time, discounting in this segment is rampant — knocking $5,000 off your price shouldn’t be that difficult, especially as we head further into the model year.